The stories collected and preserved by Louis Bird come from the Winisk River people, who are a part of the Omushkegowak or People of the Muskeg. Outsiders know them in English as Swampy Cree. The Winisk River people live in an area known as the James Bay-Hudson Bay lowlands. This band of rich muskeg edged at the shore with ecologically diverse tidal marshes extends inland from Hudson and James Bays to a maximum of about 400 kilometres, and has seen human occupation for nearly 4000 years. Every century the area of the coastal region increases by one to two square kilometers, as the land rebounds from the glacial ice sheet that once covered it; the resulting changes in landscape can be seen within a single lifetime. Although most of the lowlands are swampy, local vegetation varies widely. Coastal tundra and old beach ridges attract caribou and other animals, and river valleys exhibit a diverse ecology. In summer, marshes and estuaries on the coast play host to hundreds of thousands of migratory birds and waterfowl, and the rivers and lakes support a variety of fishes. In the past, the Omushkego Cree traveled seasonally to harvest these resources, a pattern that continued well into the twentieth century. 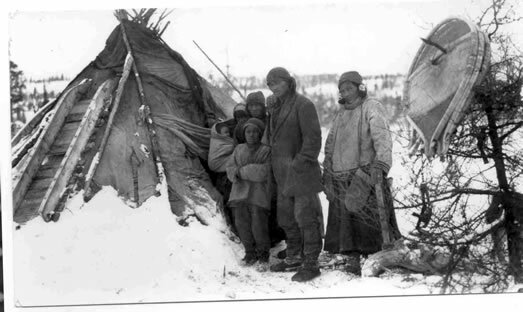 Image of a Cree family outside their winter tent, ca. 1936. Archives Deschatelets. Fonds Moosonee, Dossier Albany, Personnes 8. From earliest times, the Omushkegowak were linked to an extensive trade network. Following this network, European goods later traveled from the St. Lawrence River basin in exchange for northern furs. Beginning in 1610, Europeans began to explore the Hudson Bay region, looking for the much-sought Northwest Passage to the Pacific Ocean and Asia. In 1612 Thomas Button set out to investigate the region and in 1619, Jens Munk led a Danish expedition into the area. In 1631, Thomas James and Luke Foxe each led expeditions to explore the Hudson Bay coast. Neither found the Northwest Passage, but other explorers soon viewed the Bay area as a trading destination in itself. From the 1650s to the 1670s, First Nations in the James Bay lowlands were affected by hostilities originating far to the south as Iroquois from the St. Lawrence raided into the north in an attempt to disrupt the trade of their Algonquian enemies. In 1668-69, Medard Chouart, Sieur des Groseilliers and a group of English fur traders wintered and traded for furs at the mouth of the Rupert River in James Bay, and their success led to the founding of the Hudson's Bay Company in 1670. From 1670 to 1713, the lowland Cree were involved in complex trade relationships with French, English and other Aboriginal traders. Following 1713, the French withdrew from the Bay, although French traders based in Montreal increasingly worried the English by their presence in inland regions. First Nations people in the area adapted to French and English rivalries, sometimes turning tensions to their own advantage. Fort Albany, at the mouth of the Albany or Kashechewan River on western James Bay, was one of the earliest posts established by the Hudson's Bay Company. In 1828 the Company sent goods into the Weenusk Country directly, and in 1833-34, trader George Barnston established a post which he named Fort Concord at the head of the Winisk River. The Omushkego people traded with and sometimes worked for the fur traders, transporting goods, sailing boats and hunting for the posts, but small family groups continued to move between their seasonal hunting grounds to take advantage of changing resources. Image of Fort Albany Residential School complex ca. 1932. Caption (translated from French) reads: “1. chapel, 2. presbytery, 3. the shanty where we reside, 4. the future school, 5. the shed for construction materials. Archives Deschatelets. Fonds Moosonee, Dossier Albany, Personnes 2. Native interactions with Europeans had many consequences. Early records indicate that the Omushkego Cree were a healthy people, but contact with Europeans brought epidemics that hit the indigenous population hard. With no immunity or strategy to deal with these new diseases, many families and communities were decimated by European illnesses such as measles, mumps, smallpox and influenza. During the 1800s, Winisk hunters traded at Forts Severn and Albany, and with traders who visited the Winisk area; some of them also reached York Factory. In 1889, Hudson's Bay Company Inspecting Officer J. McDougall noted that "goods are annually given to an Indian who hunts on the Weenusk River, and at the same time does considerable trade. [This Native] used to visit Severn every year until about 1882 or "83, when the first Outfit was sent to the Weenusk. In 1901, the Company created a permanent trading post at Winisk. By 1905, the Hudson's Bay Company faced competition from traders of Revillon Freres, who traded at Winisk from 1915 to 1927. During this time, Winisk offered a place for people to meet and socialize while they traded for European goods in summer, but otherwise their old seasonal patterns continued. The first missionary to visit the area was the Jesuit Father Albanel, in the late 1600s, but a concerted church presence in the region began in 1840, when the Wesleyan Missionary Society established a mission at Moose Factory. This mission continued until 1847. In 1844, the Oblates of Mary Immaculate, a Roman Catholic order, were granted permission to missionize the region during the summer, but not to winter there. The Oblates began to travel into the region by 1847. Anglican missionaries were active as well. From 1847 until 1891 Oblates traveled every summer to Fort Albany and Attawapiskat, and by the 1880s about 76 Catholic convert families visited Albany where the missionaries were stationed. 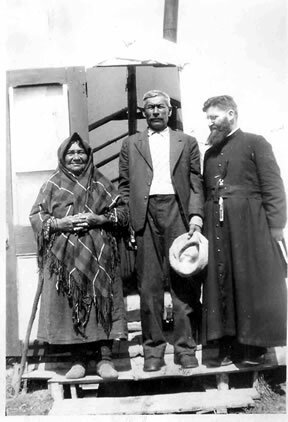 Image of unidentified Cree couple with Oblate Father. Archives Deschatelets. Fonds Moosonee. Dossier Attawapiskat. In 1904 the Oblates built Ste-Anne's residential school at Albany. 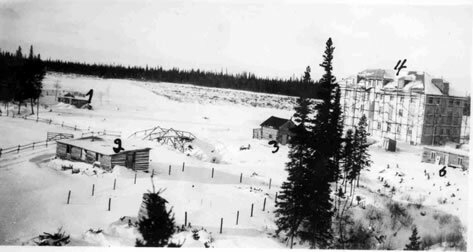 In 1891, they were given permission to establish a year-round mission at Fort Albany, and in 1893, Father J. Guinard also established a mission outpost at the mouth of the Winisk River. A rectory was built at Winisk in 1900, and in 1924, the Oblates established Winisk as a permanent mission, residing there year-round beginning in 1935. In 1936, some children from Winisk began to attend Ste-Anne's residential school at Albany. In addition to Anglican and Roman Catholic missionaries, Mennonites and other groups also traveled to the Winisk area. By 1973 there was a resident teacher in Winisk, and younger children no longer had to travel out of the community to attend school. 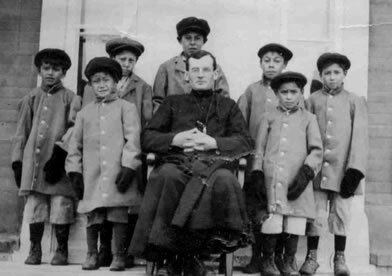 Image of Father Emile Saindon with seven unidentified Cree boys. Archives Deschatelets. Fonds Saindon. 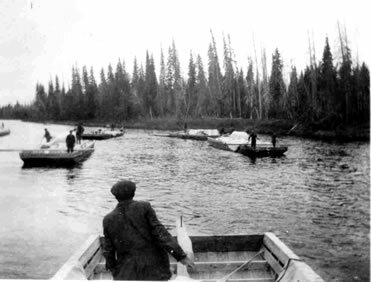 In 1912, the Ontario boundary was extended north of the Albany River, and during the summers of 1929 and 1930 Treaty commissioners visited Winisk and other communities to secure adhesions to Treaty Nine. In 1955-56 Canada established the Mid-Canada Line radar system and built a radar base directly across the river from Winisk. By 1965, the Mid-Canada system was closed down. Construction of the project provided some temporary local employment, but the few long-term jobs at the base went to southerners brought in to perform specialized tasks. Despite its short duration, the radar base had profound social effects in the area. Into the 1970s, the village of Winisk continued to be more a meeting place for families than a permanent settlement. Families would use the town with its Hudson's Bay Post and Catholic mission as a base, travelling from there to their hunting grounds. Seasonal flooding of Winisk had been a regular problem since the site was established. Serious flooding occurred at the Winisk town site in 1953 and again in 1967. On 16 May 1986 a disastrous flood washed away the community, killing two of its members. The community moved inland to a site known today as Peawanuck, approximately 32 kilometers upriver from the former site of Winisk. Changes in the twentieth century, including Treaty Nine, the Mid-Canada Line radar base, and the move to Peawanuck have meant significant disruption to the lives of the Winisk People. For over 100 years, the settlement of Winisk offered facilities for trade and a seasonal meeting place. The settlement played a significant part in the story of the Omushkegowak of the Winisk area. Today about 300 people live in the new community of Peawanuck. Here, children in the lower grades attend a community school, and the traditional lifestyle of seasonal migration is giving way to a more sedentary existence for at least part of the year. Many families continue to depend on the land for at least part of their subsistence, and the community is looking for innovative ways to generate revenue, such as developing ecotourism opportunities. Further Readings The following articles, books, and resources are good starting points for research on the Omushkego people and Hudson and James Bay history. Beardy, Flora and Robert Coutts, eds., Voices from Hudson Bay : Cree Stories from York Factory. Montreal: McGill-Queen's University Press, 1997. Brightman, Robert A. Acaoohkiwina and Acimowina: Traditional Narratives of the Rock Cree Indians. Mercury Series/Canadian Ethnology Service Paper 113, Hull, Quebec Canadian Museum of Civilization, 1989. Flannery, Regina, Ellen Smallboy: Glimpses of a Cree Woman's life. Montreal: McGill-Queen's University Press, 1995. Francis, Daniel, and Toby Morantz, Partners in Furs: A History of the Fur Trade in Eastern James Bay, 1600-1870. Montreal: McGill-Queen's University Press, 1983. Fulford, George with Louis Bird, Who is Breaking the First Commandment? : Oblate Teachings and Cree Responses in the Hudson Bay Lowlands. Reading Beyond Words: Contexts for Native History. 2nd rev. edition, eds. Jennifer S.H. Brown and Elizabeth Vibert, Peterborough, ON: Broadview Press, 2003. Honigmann, John J., The West Main Cree in The Handbook of North American Indians, vol. 6, Subarctic, William C. Sturtevant, general editor. Washington : Smithsonian Institution, 1981, 217-230. Hubbert, Mildred Young, Winisk: on the Shore of Hudson Bay. Toronto: Natural Heritage Books, 1997. Hudson's Bay Company Archives. The records of the Hudson's Bay Company Archives provide valuable information on the area, particularly regarding the fur trade. A finding aid and other information on the archives can be found at http://www.gov.mb.ca/chc/archives/hbca/. John S. Long, Who Got What at Winisk? The Beaver, February/March 1995, volume 75, issue 1, 23-31. Available online through Ebscohost. Lytwyn, Victor P., Muskegowuck Athinuwick: Original People of the Great Swampy Land. Winnipeg: University of Manitoba Press, 2002. Preston, Richard J., Cree Narrative: Expressing the Personal Meanings of Events, 2nd ed., Montreal: McGill-Queen's University Press, 2002. Rordam, Vita, Winisk: A Cree Indian Settlement on Hudson Bay. Nepean, ON: Borealis Books, 1998.